When you get up in the morning and you take your first steps, I want you to say to yourself. I am amazing! When you are getting your steps in during the day and are moving around, I want you to think. I am amazing and doing amazing things with my body! When you are having your absolute best day and getting lots of steps in and meeting your goals and hitting new milestones, I want you to feel those positive emotions and then tell yourself. I am amazing!! And finally, when you are not feeling well, when you are struggling and having a bad day, I want you to experience those negative emotions and then say to yourself. But, I am still a alive and I am still amazing! You become what you think about most. Who do you want to become today? TGIM ~ Never Give Up! May your heart be full of love today. May there be purpose and intention in all your steps today. Affirmation of the day: Don’t try to change the world. Just find something you love and do it every day. In time, the world will change. Sometimes in life you gotta get a little crazy to get through it. You gotta get creative with when you get your steps in, or your work out in, or your movement in , or you me time in. To be in human relationship with one another is sometimes a crazy roller-coaster. Be in relationships anyway. To get your steps in sometimes means walking around more at work, before work, after work or all three. Get your steps in anyway. You got one life to live. Be your most awesome and authentic self today and every day. Success Rule of the day – Your life only gets better when you get better. Your outer world will always be a reflection of your inner world. If you want to improve the quality of your outer world you must go to work on yourself. Since there’s no limit on how much better you can get, there’s no limit to how much better you can make your life. Just take the next step towards your goal. You do not have to have it all figured out to make forward progress. Put one foot in front of the other. Just move forward. Be in constant forward motion. Life is an open book with blank pages. Write the next chapter in your life. Have fun putting your body into motion today! Let’s make it the best week of 2017! Why not right? You don’t need a New Year to make a change. 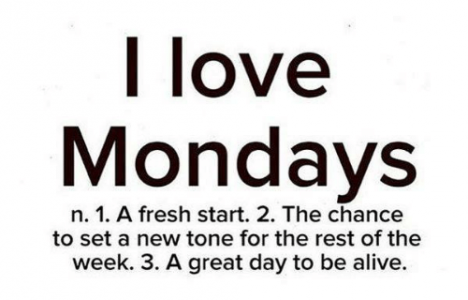 All you need is Monday!